In a large bowl, combine the ground turkey and beef, eggs, breadcrumbs, thyme, oregano, basil, garlic, onion, salt, pepper and Parmesan cheese. Try not over handle the mixture otherwise it will get tough. Place the mixture in the greased loaf pan and form into a loaf. Top the meatloaf with pasta sauce. 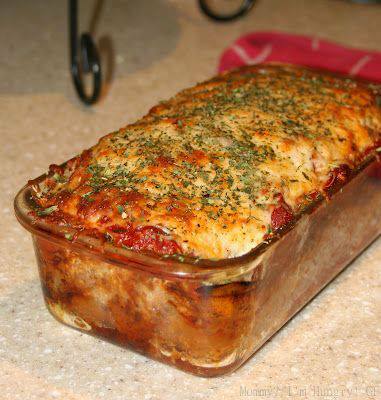 Place filled loaf pan on a baking sheet and bake in the preheated oven for 45 minutes - 1 hour. Remove the meatloaf from the oven and sprinkle the top with the remaining shredded cheese. Place the meatloaf back in the oven and bake until the cheese is melted.